Sitting atop my energetic steed, I’m hurtling north on Interstate 5 over the hills of Southern California. The cars at the edge of my vision begin to blur with speed, and as I look down at the beautiful 6.5-inch LCD display between my hands I realize I’m way over the limit. So I roll off the throttle, set the cruise control at an acceptable velocity, and lean into the hours of comfortable travel in front of me with this do-it-all adventure motorcycle. I’m heading to San Francisco to meet up with a buddy for three days of riding and camping along the California coast and its mountainous backroads. Back in my twenties, I drooled over bikes like the Ninja ZX-6R and Honda Interceptor. I wished to channel my inner Maverick and fulfill that bone-headed need for speed. When the 1290 Super Adventure debuted, I thought its new face was a tad disturbing and far too alien. But after going for a ride and experiencing its brutality, it all began to make sense. This bike is from another world. But well into my thirties, I’m looking for more of a balance between pure comfort and outright performance—and the KTM 1290 Super Adventure S checks every box in the book. Adventure bikes are ultra capable machines, and KTM is king of the hill for a multitude of reasons. Beyond being blisteringly fast, it retains a comfortable upright riding position and an adjustable suspension that soaks up a road’s every imperfection. It really is the Swiss Austrian army knife of motorcycles. I'll say it right now, the KTM 1290 Super Adventure S is very high my list of favorite motorcycles ever. It's simply just that good. Before setting off, I loaded out this Austrian mountain goat with over 100 pounds of camping and photography gear. It isn’t always the easiest to get the weight balance right when packing a bike, but fortunately, the KTM offers a semi-active suspension system that can be programmed to compensate for any extra weight you're carrying. It’s practically idiot-proof. Want to account for the passenger you are ferrying? Select the two-up mode. Want to set things up for carrying luggage and gear? There’s an option for that too. After that first hard pull on the highway, I find myself checking to see if my gear is still there. Not because I doubted my ability to secure my gear—but because I can’t feel the extra weight at all. The KTM is unfazed. For the next five hours, I’m committed to the highway. The bike’s 6.1-gallon gas tank affords around 200 miles of range, but after more than a few bouts of excessive acceleration, I only manage 160 before stopping. Then again, I always get a tad nervous when the fuel light blinks on. I’m also conditioned to stop and stretch my legs constantly on a moto trip thanks to my 6’5” frame, but the sublime ergonomics on the 1290 Super Adventure are near perfect. After a good night out with great friends, my buddy and I rise with the sun and head for the Pacific coast the next day. While the KTM made a surprisingly solid highway cruiser the day before, it’s no great shock that it shines in the twisties. It weighs 560 pounds with a full tank of gas, and the bike’s Sport mode (accessible through a Super-Nintendo-like directional pad on the left-hand grip) tightens up the suspension and throttle response beautifully. 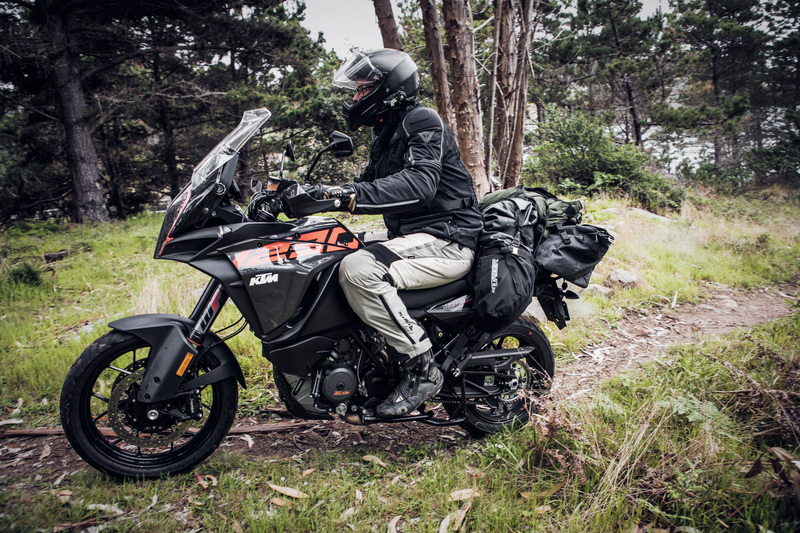 Granted I am not getting a knee down here with 100 pounds of gear in tow, but that doesn't mean that you can't with the KTM Super Adventure S. It is more than capable of track day level thrills. With the tiniest flick of the wrist, power is put down to the rear wheel and the 1290 Super Adventure rockets forward like the USS Enterprise hitting warp speed. And you know what? It sounds even better. Wheelies aplenty on the 1290 Super Adventure S.
I’m fully focused on the experience at hand, and my friend vanishes from my mirror as I hammer through the corners and sweepers with gusto. Hitting those fast entries and aggressive exits atop a burly adventure machine loaded down with camping gear felt like riding a track weapon with an identity crisis. And that’s what makes the 1290 Super Adventure S such a remarkable machine. The 1301cc 75 degree V-Twin is this Austrian beast’s shining jewel, its 160 horsepower power output a blinding gleam. The refined, ultra-lightweight tubular trellis frame provides the necessary stability to control all that brute power, and the configurable WP Suspension system (with separate Race, Road, Comfort, and Off-Road modes) is arguably one of the best out there, allowing any rider to adjust the road feel to their liking. This is a bike that seamlessly offers a performance experience for thrill junkies and the all the requisite comforts for long-haul riders. Throw in an array of rider-focused technology like cornering ABS, traction control, a quick shifter, and active rev-matching on the downshifts, and the KTM Super Adventure S tames its ferocious nature just enough to feel appropriate and manageable. As a mere mortal, I promise you, you’ll feel more like a god in total control of your domain. But turn off any (or all) of these safety systems, and you best be sure you are fully capable of handling the power now bestowed upon you. Like any motorcycle, the 1290 Super Adventure S can be unforgiving in reckless hands. Snap the throttle open in first or second, or slip the clutch in third, and the front wheel will levitate toward the heavens like it’s being called home. Apply too much throttle in a corner and the back end can kick out; brake too abruptly, and the four-piston Brembo brakes are liable to lock up the front. If you want to let the beast off its chain, be prepared to give it your full attention. So the KTM 1290 Super Adventure S is about as close to perfect as motorcycles can get in my opinion. But where does it fall a little short? Ironically, for riders under six feet. It’s a pretty tall bike, so while my gigantic self felt perfectly comfortable, shorter riders might have a different experience. It’s also heavy, though you don’t really feel that weight except at low speeds. There are a few other minor gripes, some more important than others. You can’t use cruise control if you deactivate the traction control system, which I find silly considering motorcycles have had the former for a lot longer than the latter. I would have loved a physical switch for the heated grips, rather than having to turn them on via the menu screen. And my iPhone 7 Plus didn’t fit due to its size and case in the KTM’s integrated smartphone cubby, a disappointment that I chased away with a quick flick of the wrist. A flick of the wrist brings it right up. If you think a do-it-all motorcycle that has the potential to replace the rest of your fleet won’t come cheap, you are somewhat correct. The KTM 1290 Super Adventure S comes it at $18,000—but again, you’re getting exactly what you pay for. This bike packs supercar and grand touring performance into one of the best road-going packages you can buy right now. 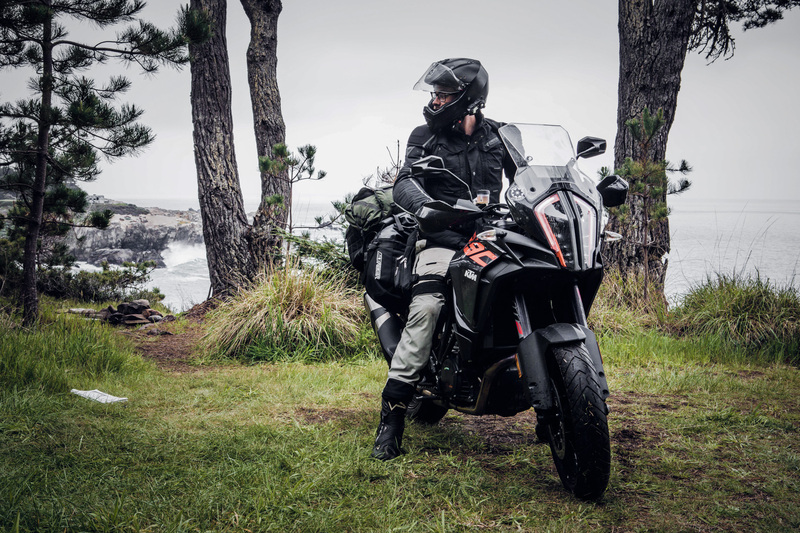 An off-road-focused bike like the company’s 1290 Super Adventure R or the 1090 Adventure R might get you farther off the beaten path, but the S model still has the all-terrain ability to tackle a rough fire road with ease. There is nothing quite like taking a break and enjoying a snack away from the roadway. 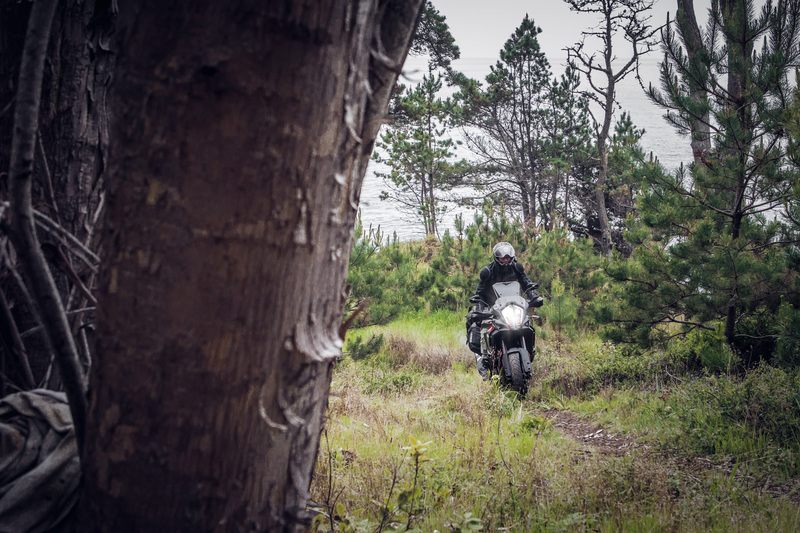 That’s the thing about an adventure bike—its go-anywhere spirit will enhance your life in a way that few vehicles can, and this particular one offers an unrivaled balance between its civilized and wild sides. If I had the scratch, this is the motorcycle I would go out and buy today. Sam Bendall is The Drive’s motorcycle-obsessed contributing writer. He rides, tests, and lives a life on two wheels. His goal is a simple one: expose everyone to the wonderful world of motorcycles and get them out there riding and maybe, just maybe, camping too. He is based out of Los Angeles, California.